The project is bootstrapped with a few hundred dollars to cover hosting. Part of my reasoning for starting internshipIN was to show my friends (and the world) that it doesn’t take more than a $200 to throw a website together. The manpower required to put together the site was absolutely minimal. You can tell. The site is still pretty raw. 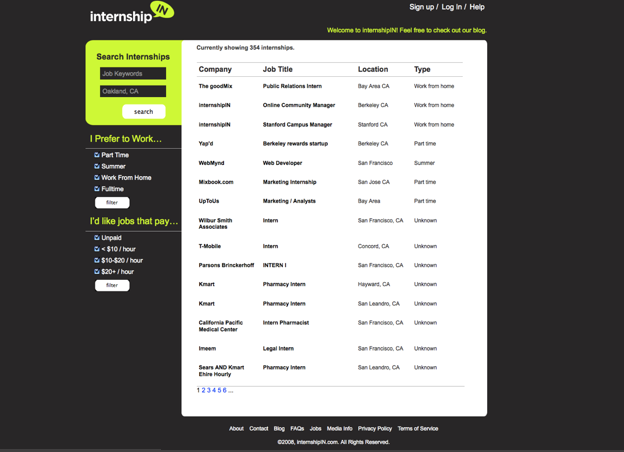 It scrapes internship listings from Simply Hired and allows employers to post their own. By default, the internship search page figures out your location by your IP address and lists internships in your area. You can refine the search by location or keywords. But there is no way to browse through different categories or see recent listings. The navigation and search needs work. There are alternatives, such as After College. But a site that just does internship listings could work. What would be better would be a site that combines listings with ratings. Maybe Mah should try to pair up with InternshipRatings. This is a unique opportunity for an ambitious, multi-talented individual who wants to see the inside of a fast-moving blog startup and work closely with the co-Editor. The ideal candidate is a future journalist or entrepreneur who is willing to work hard and do a wide variety of non-glamorous tasks for a few months in order to get their foot in the door, learn, and make connections. You will work directly with TechCrunch co-Editor Erick Schonfeld, with the simple goal of saving him time. Which means: The level of work you’ll do is only limited by your capabilities. Are you capable of: Writing blog posts under deadline? Researching a company? Coding? Great, as long as you’re also willing to do Google searches and make phone calls. Essentially, you should be overqualified to be an assistant, but not have a problem doing assistant-like tasks. In exchange, you’ll get unique visibility into a unique media company, a great learning experience, and the chance to move on to do many other things (at TechCrunch, or elsewhere—with a strong endorsement). 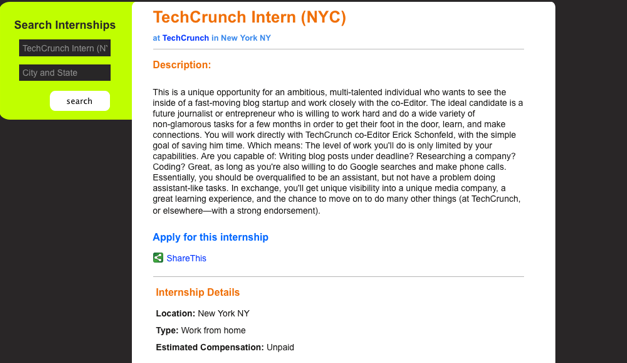 If there are any takers, email me at erick [at] techcrunch. It is unpaid, but who knows what it could lead to (any out-of-work journalists are welcome to apply as well). We also have an opening for a Crunchbase analyst, and that even comes with a salary.